Scientists have long wondered how the extinct flying reptiles, the pterosaurs, could fly. They seemed too ungainly to lift into the air from the ground, or to land safely without breaking their delicate wings. Quite reasonably, some scientists proposed that there must have been greater air pressure in the past. This unique design speaks of a Master Flight Engineer. 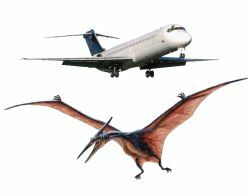 The pteroid and flap enabled the pterosaur to use ‘aerodynamic tricks like those found in modern aircraft’.5 Angling this flap would increase lift by a huge 30%, so even the largest pterosaurs could take off by simply spreading their wings into a moderate breeze. And this extra lift would mean their minimum flying speed (i.e. below which they would stall) was reduced by 15%, allowing a smooth landing. Also, by flexing the pteroid on one wing and extending it on the other, they would have different lifts on both wings, enabling them to bank during turns. 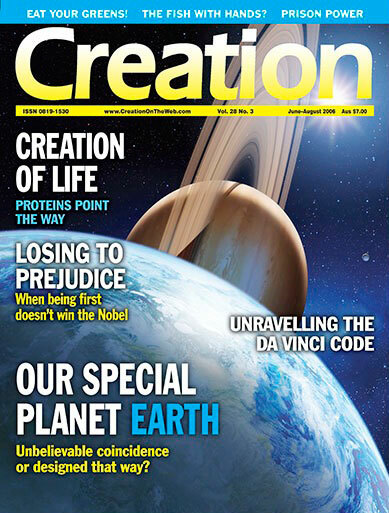 This unique design speaks of a Master Flight Engineer, who designed flying creatures that could work efficiently in ordinary air pressure (Genesis 1:20–23). Terrific pterosaur flyers, Creation 28(2):9, 2004. Return to text. Pterrific pterosaurs, Creation 27(2):7, 2005. Return to text. Wilkinson, M.T., Unwin, D.M., Ellington, C.P., High lift function of the pteroid bone and forewing of pterosaurs, Proceedings of the Royal Society 273(1582):119–126, 7 January 2006 (DOI: 10.1098/rspb. 2005. 3278). Return to text. Marks, P., Where flying lizards got their lift, New Scientist 188(2521):12, 15 October 2005. Return to text. 17 October 2005. Return to text.